It’s not too late to join Garrison Brothers Distillery in their effort to raise money to repair the historic Balmorhea State Park pool. The pool has been closed since early May when part of the structure collapsed during the pool’s annual cleaning, which was attributed to decades of erosion from spring flow. Texas Parks and Wildlife Foundation (TPWF) has established a fund to raise $2 million for the repairs. 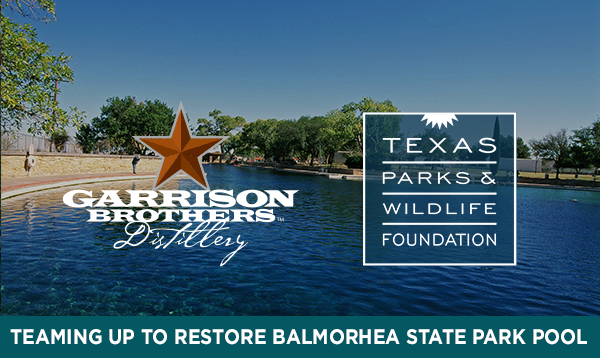 And for every bottle of Garrison Brothers Balmorhea Bourbon sold this year, Garrison Brothers will donate $5 to TPWF to restore the historic Balmorhea State Park pool. Join Garrison Brothers in the effort to reopen the historic West Texas treasure that Texans have enjoyed for generations by donating today. What’s even better? Every dollar raised will go toward the Apache Corporation’s challenge grant to match gifts dollar for dollar up to $1 million to repair the pool. You can help reopen the pool and double the impact of your gift today. *Texas Parks and Wildlife Foundation (TPWF) considers “members” synonymous with “donors;” TPWF does not have members as defined by the Texas Business Organizations Code.